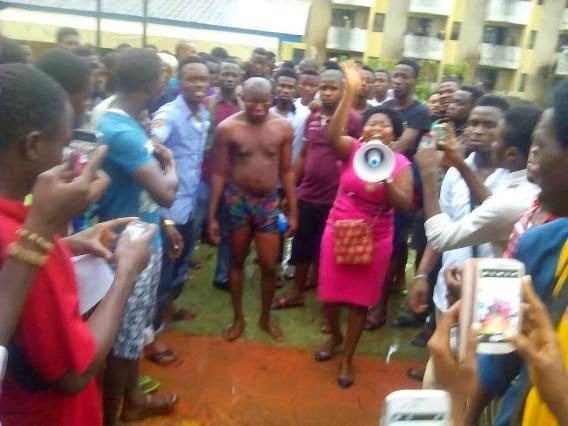 Alleged r*apist Abayomi (pictured shirtless) was caught in Ife town outside OAU campus today. He was alleged to have ra*ped a student from the department of Dramatic Art, Faculty of Art Of Obafemi Awolowo University outside the school campus somewhere behind Damico Institute Along Ede Road, Ife Osun State. He was caught after the r*ape victim reported to the Students Union who promptly went looking for him. He was brought back to OAU where he was paraded at the Senate Building this evening. He has since been handed over to school security who will hand him over to police.